by Julie on October 8, 2012 » Add the first comment. Just in case you forgot (not that you possibly could) Young Audiences has an incredible roster of teaching artists working in all sorts of media. Each week we will feature a different artist here on our blog and over on our Facebook page. Self portrait by Lisa Rosalie Eisenberg. 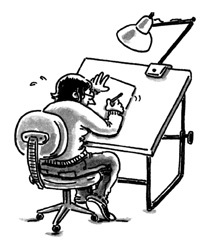 Our first featured artist is (drumroll please…) cartoonist, illustrator, and comics maven Lisa Rosalie Eisenberg. Hailing from the Garden State, Lisa now calls the NW home. In addition to teaching, Lisa self-publishes the comic series I Cut My Hair, has appeared in the anthologies Papercutter, Bird Hurdler, and Bearfight!, and is a member of the studio Tranquility Base. Check out her Young Audiences artist page here. Why do you choose to work with children? I believe that education can be an empowering experience for children, and I want to be a part of that. I love serving students by working with them in the artistic medium I love: comics. Illustration by Lisa Rosalie Eisenberg. In my residencies, I hope that the students learn… How to clearly and effectively communicate their ideas through comics. How to tell stories in a unique way by combining words and pictures, and that they *can* write and *can* draw. My favorite part of working with kids is… Building relationships and learning more about their points of view. What’s the best thing about being a Young Audiences teaching artist? Getting to combine the two things I love most: comics and working with youth. “Ocean Friends” illustration by Lisa Rosalie Eisenberg. If you could be any animal, what would you be? A duck. I’ve always loved to draw ducks…perhaps my love for ducks is part of what brought me to Oregon, subconsciously? What was a great teaching moment? One student in my class wasn’t terribly excited about making her comic, but a turning point came when I recommended a comic strip collection to her that she really loved. She read the whole thing and it inspired her to complete her own comic project, which turned out great. Afterwards she told me that she had started to really love comics. What is one of your earliest art memories? My mom reading to me from children’s picture books, particularly the work of Maurice Sendak, Leo Lionni, and William Steig. I felt a real connection to the illustrations, and I think the combination of words and images in those books planted the seeds that would eventually lead to a love of comics. What teacher or artist was inspirational to you as a kid? Who is your art hero now? Bill Watterson’s comic strip “Calvin and Hobbes” was a big inspiration. Lynda Barry is my current art hero.